Thanks all for the concern. I'm doing well, I just haven't had the time to do anything. I've decided that I'm going to cut back on the products that I print myself. It's a lot of work, which was mostly expected, but it isn't very enjoyable for me. I'll be keeping the products that can't be printed through Shapeways available on the website. For now, the listings will stay up but I'll remove the purchase links on products that are available on Shapeways and I'll have a link to the Shapeways product instead. This isn't a decision I take lightly, I've been mulling about it for about a month. What I will also do is offer replacement parts. If anything from purchased product from Shapeways is damaged or lost, you can contact me through Shapeways or my website and I'll print a copy of that missing part for you. I'll also still do one-offs. Like say, for example, you wanted a 1/6 M110 SASS, I will still do that. I'll complete the couple of orders I've received up until now but I won't be taking more orders for items that are also available on Shapeways. I think the clamp is different. 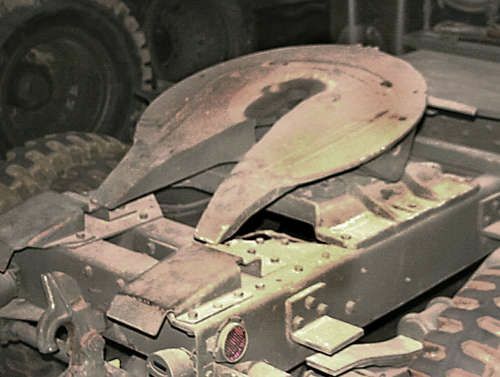 How about a lower turret part for the AFV M60A1 that would allow building an M60A1 with original unreinforced turret ring (like the early Tamiya M60A1 turret). 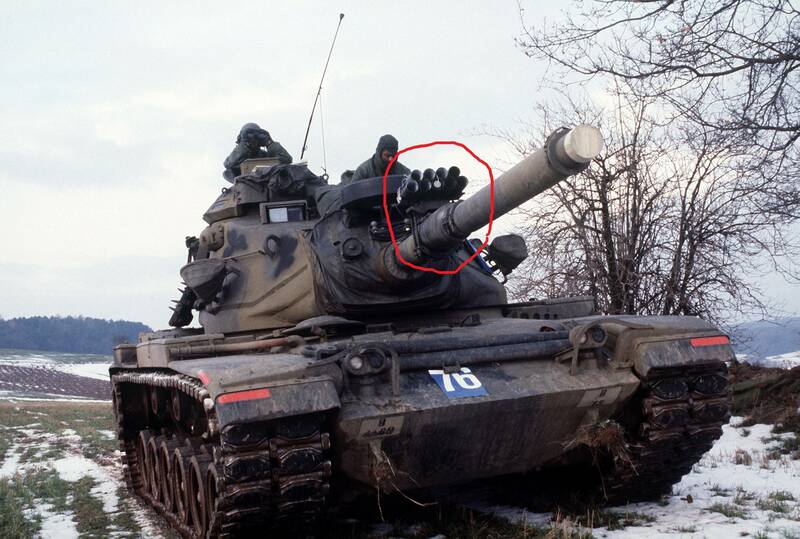 did you manage to do a deal with mouse house on 1/25 centurion 105mm barrels. How about a Hofmann device? Typicaly seen on US vehicles during Reforger exercises. Available in an old Tamiya accesory set and the old Italeri Leopard kit, but not available as a separate item. MIKE, I just want to revisit a product suggestion I made some months ago. 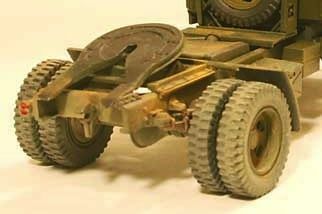 The idea of offering a fifth wheel assembly for a WWII US Army semi tractor. Small, easy to print with a small part count. This would be a popular item for folks like me doing a lot of truck/trailer conversions and files a mostly vacant market niche. 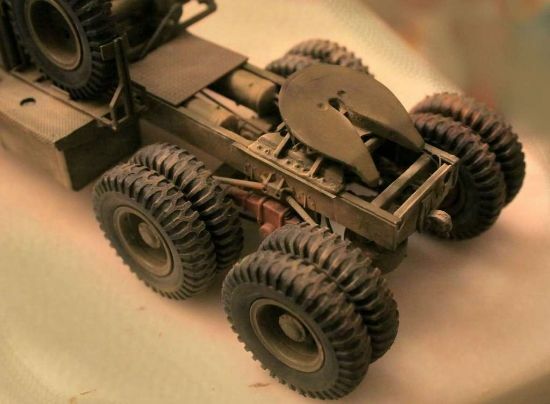 So far I have used two of these in 1/35th scale and could use at least two more. Up till now I have had to come up with alternate sources. One I converted off a toy truck and the other came from a Eastern European company "Custom Factory" and that one had molding problems and (IMHO) a lack of detail. The base plate is as wide as the standard US truck frame width which is a measurement I can come up with, and the fifth "wheel" plate dish uses the same diameter as the width of the base plate. 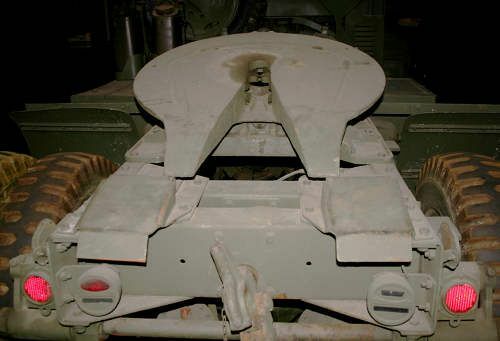 Most all 40's era fifth wheels were circular. Some modern ones are oval. - Here is the Custom Factory unit that I feel is poorly detailed. It is installed here on my converted White 666 tractor. I had to modify plus add detail to this one and I feel it is still not as good as the toy truck unit. I would like to replace this one at some point in the future. My next planned conversion would be the the Studebaker Deuce into a semi-tractor. This is an easy convert as it uses the standard 3-axle truck with no modifications and simply swaps the load box for the fifth wheel and adds an brake hose tower. I could probably do some rough sketches of the assembly if that would help. Otherwise known as footman's loops. Been used almost unchanged since the 1700's on horse drawn carriages, motor vehicles and tanks by . . . . (no surprise here) footmen, drivers and GI's. Just sharing - trying to be a bit funny - not trying to be a smart A$$. really ? I couldnt locate any I have tried searching the site 3-4 times unless they are listed as something else , would you happen to have a link to them ? Is this the type you want here? Removed by original poster on 02/12/19 - 17:06:13 (GMT). Removed by original poster on 02/12/19 - 13:32:26 (GMT). -T-72 Ural track guards: if you can get drawings and dimensions I'd be able to do them. I can't find any with a very quick Google search and I don't have the time to do very much research for any references. As far as the cost for the Tricons, I'm not sure. It probably would be cheaper than Shapeways just because that's how almost everything is. As far as how much cheaper, I don't know but checking is pretty easy. No problem there - I just asked about the Tricon as the question occurred to me. Probably the cost on three of them is still too steep for me. Just wanted you to know there was still an interest on some level. 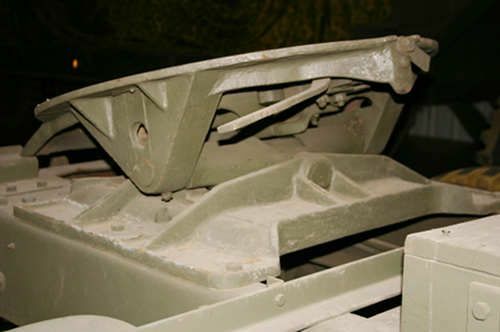 -I can definitely attempt the M113 interior parts if anyone can get all the details for the needed pieces to me. I've said that I didn't have time to do research in previous semesters but this semester I really don't have time for proper research. -Same for the M35/M109 low-light grill. If anyone can get some drawings with some dimensions on it, it would make it easier to do and would save time. -Mike: I don't know if the tricon would be cheaper but, if I can print it, I'd try to print the entire container. I've been having very bad luck trying to print individual parts that need to be assembled. I found that I can't print the T49/T67 because of that. I also forgot to get your trailer doors printed. For now, my printing is on hold because of the amount of schoolwork I have.